Loving vintage perfume is a masochist's game, but a masochist of a special variety: the optimistic masochist. To love vintage perfume is to pursue what has vanished, been discontinued, or consigned to oblivion, in the hopes of reaching through time to bring it back. If the fugutive scent returns, you feel like a magician pulling a rabbit out of a hat, or a medium getting in touch with long-departed spirits. There's something almost occult about having such an intimate connection to history. Open the genie bottle, anoint yourself, inhale deeply, and there it is — a fragrance that a lovely young woman once wore on her way to a party, long ago, in a sepia'd past. I was researching information online about the animal note ambergris (the oxidized regurgitation from the sperm whale that washes ashore and has a sweet, musky, marine scent). I kept running into the Creed perfume Angélique Encens as one of the few perfumes available that is supposed to have real ambergris in it. As if that weren't tantalizing enough, it was said either to have been made for Marlene Dietrich and/or been a favorite of hers. So I went to Saks Fifth Avenue in New Orleans searching for it. I approached the charming and helpful rep for Creed (hi, Sarah!) 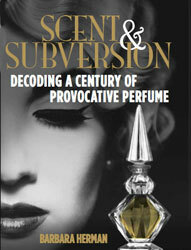 with a question: "Do you have the perfume that was made for Marlene Dietrich?" (I couldn't even remember the name.) After searching her list and drawing a blank, she made a few taps on her iPhone, and said, "Oh, yes. Angélique Encens. Unfortunately, Creed is pulling it from the shelves." (Um, what?! But I shouldn't be surprised: of course I want what has just been discontinued!) "Oh, but wait," she said, and magically pulled out a bottle tucked away in some bottom shelf behind the Creed counter. "Here it is," and without a word, she began to decant a sample for me. In other words, this optimistic masochist got lucky. Angélique Encens (Angelica or angelic incense) is heavenly, an animalic as light as a cloud, but with darkness and bite. Dirty and divine. At first I thought — wow, this smells like Shalimar, so intense was its civet-like animal note; Angélique Encens' angelica, vanilla and ambergris also echoed Shalimar's holy trinity of bergamot, vanilla and civet. It is more ethereal and less carnal than Shalimar, though. Its head is in the clouds, befitting its name. Angelique or angelica is a genus of about 60 kinds of herbs in the family Apiacea that have been described as having a peppery, herbal, earthy, woody, and musky odor. "Angélique" is also a pun on the word angelic, with its connotations of heavenly, sweet and divine. What stands out for me is Angélique Encens' initial peppery/herbal notes combined with nose-tickling incense, followed by the downy-softest vanilla, with a musky, civet-like animal note hovering in the background. For me, the florals are very much in the background, the perfume's silver lining if you will, adding sensuality very subtly from behind the scenes. I can smell their indolic richness adding to the perfume's depth, but again, very subtly. The animal note recedes in the dry down, and you're left with a whisper of a vanilla skin-scent that's comforting and ethereal. If there is indeed ambergris in Angélique Encens, it provides both lightness and depth to the perfume. I have a tincture of ethically-harvested ambergris from The Perfumer's Apprentice, and I performed a simple experiment that Luca Turin once described. Put ambergris on one hand with a perfume on top of it, and that same perfume on the other hand without ambergris. Compare the two. Amazingly: the scent with ambergris didn't smell different — but it did smell like its notes and their facets were under a magnifying glass — glowing, bigger, more legible. Perhaps the ambergris in Angélique Encens makes the other notes more radiant, like a ray of sunshine through a cloud; it also seeds the cloud and brings it down to earth, giving it that musky, civety, dirty smell. I say this because for a perfume with so few notes, Angélique Encens manages to leave quite an impression on me. Alas, Angélique Encens is joining the other dearly departed souls in vintage perfume heaven, and, having been $280 for a 250 ml bottle, it was probably out of our leagues while it roamed the earth. But we vintage perfume lovers, occultists and mediums that we are, know that we can cheat death, and will get our hands on it one way or another. What a great post. You've made me want to check if my local Creed counter still has any. I wonder why they discontinued it? I always wonder that, kjanicki — why discontinue a classic? I think I read somewhere that Creed might bring out this and others it discontinued every 10 years or so, but if you're interested, go to your local Creed counter and ask if they can decant you a bit of the stuff they must have lying around. (They'll probably have to fish around for it — it's no longer displayed.) AE is pretty wonderful. I think I'm going to review Ambre Cannelle, another of their older scents, pretty soon. Thanks for stopping by! Thanks, Melissa! If they have it, it would be great for them to hand it out, I think. Definitely would generate more interest in the Creed line. I know I'm going back, as I told kj, to smell and write about Ambre Cannelle. Thanks, Emma. It seemed strange to look for a perfume I'd just read about, and then have someone tell me it was recently discontinued. It's like I have the opposite of the Midas touch! I just found your wonderful blog! I'm currently re-creating a 1940's wardrobe and of course one has to have the right scent for it. A sample of Angélique Encens is on it's way to me right now and I can't wait to try it out. I'm quite sure that I will love it and be devestated because it will be so hard to find. Welcome to my world, Isis, where most of the things I love are hard to find! Your project sounds fun — 40s clothes are my favorite. I hope you find Angelique Encens, and if you can't, there are so many other 40s scents that are amazing...Fracas, Bandit, Miss Dior, Vent Vert, Antilope...all on eBay at one point or another. Good luck!